I remember when I was younger, this game gave me nightmares for weeks, and literally scared me from the genre for a long time. Now that I'm older and wiser I'd grit my teeth through the scary parts (which aren't as scary as I remember) and see that this was actually a great game with a great story. 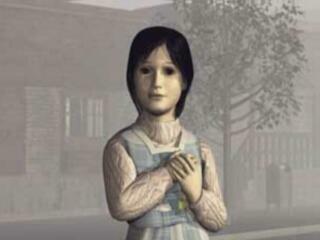 The game starts out with a man named Harry taking his daughter to Silent Hill for a vacation. He'd been driving through the night, rubbed his eyes looked up and saw a woman in the road, swerved to evade the woman and ran into the cliff wall, knocking him unconscious. When he awakes his daughter isn't in the car, he goes out into the foggy town of Silent Hill to find her and that's how the story begins. While the graphics might have looked really nice when the game came out, they look kind of bad now. The characters are blocky, the main character runs funny, he holds a gun funny, and the enemies, while looking scary at first, start to look funny also, but this game came out 10 or so years ago, so.... it's kind of understandable. But everything else looks really nice, the town is creepy looking, the buildings are creepy (sometimes, like when there supposed to look creepy), and the CG scenes (shown mainly at the beginning and the end of the game) are really nice. While the graphics of this game are lacking, the sound effects make up for it ten fold. You will receive a radio in the game; while the radio seems broken and wont find any stations, it will pick up white noise when enemies get near you. Nothing worse than running threw the town trying to find your way to the next area and suddenly hearing a screaming white noise followed by a gorilla like creature trying to beat you into a bloody pulp. On top of that, the enemies themselves make noises too, though some of them sound kind of dumb, (like the flying enemies screech), but some sound scary and if you're not expecting it, it might startle you (like the gorilla monsters). I can't really tell you if there is music that plays through the game. Through most of the game, I know the answer is no. But during climactic parts.... maybe (I was paying more attention to the story to realize if there's music, sorry). The gameplay's like a typical survival game; you have a weird way of walking (usually having to stop and turn for the first few hours of the game, until you get a good hold of the controls). 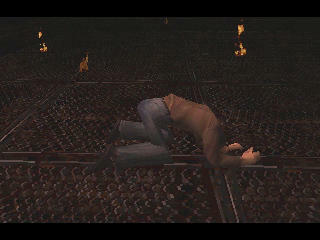 But this game does a couple of things that other survival horror games didn't do (and what makes this game shine). You have unlimited enemies but a really limited supply of ammo, which means you will have to use melee weapons you find throughout the game (like a steel pipe), but the melee weapons are really not that bad (shock shock!!!!). They will take alot of getting use to, but by the time you get to the first boss you should have them mastered (if you can work one, you can use almost all of them). Another interesting thing this game added was the use of a light. If you don't use the light you wont be able to pick up items, open doors, or use your map, so why shut your light off? Because most of the enemies in the building wont be able to see you (you can walk past them if you stay about a yard way from them). It's really nice for sneaking up on enemies so they don't get the jump on you. The map is quick keyed (you hit triangle to open it up) and you need to find maps for each new area you go to, but the game updates what rooms are locked and all that stuff. And lastly, the game has some hard riddles and puzzles, and by hard I mean HARD. One in particular took me about an hour and a half to solve, another one took me like half an hour to solve. And something about horror video games (I'm looking at you Resident Evil) is that the riddles they have aren't really riddles, just reasons to have you run around and gather items. In this game you will gather items and sometimes the items are obvious, but other times you have to solve the riddle to get a key item (like hitting keys on a piano in the correct order), real fun mind teaser stuff. Overall, this game is really fun. Kind of scary although you grow numb to it, great storyline, somewhat nice replay value (with 5 alternate endings and an ammo multiplier to make life simpler), and pretty easy to pick up and play (simple controls). I would recommend picking this game up if you see it and like the genre or just want some mind boggling riddles. (And if you don't like riddles but want the answers there's always the Internet).